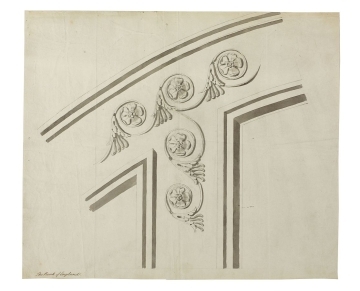 Drawing 30 is a large-scale, possibly full size, detail of ornament for some unidentified part of the lantern (possibly a soffit) employing various Greek key, acanthus, and diamond motifs. These designs were not realised; there is some light pencil hatching across the acanthus and diamond fields indicating their rejection. 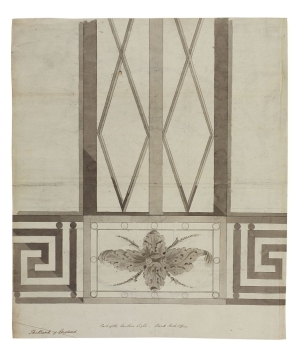 The verso of drawing 30 is a schematic plan of the lantern and its roof showing the perimeter octagonal piers and sills and the radiating rafters descending in two stages. As executed however, the lower stage apparently had fewer rafters (see drawing 49). Drawing 31 is a decoration at the junction of two fascia and is attributed to the Bank Stock Office lantern based on its inscription and location in volume 74 (Bank Stock Office drawings) with other lantern-related designs (drawings 30-34). However, no such ornament appears anywhere in the built hall.